In the previous years I was a regular at my brother's nightclub so I acquired a large range of music knowledge even before I first performed. I have seen the music industry from records to tapes to CDs to computer. I used all of these. I tailor all of my events to the client FIRST. I am happily married to my wife Lisa and I have a teenage son Charlie and currently reside in Diamond Pt NY. Absolute sound is based in Lake George, New York. We reach the New York, Massachusetts and Vermont. State of the art equipment is used both in speaker power and song selection databases. With a small setup and large sound from our JBL speakers, you’re looking at your own private concert. Absolute Sound carries thousands of titles ranging from Big Band swing to today's hot hits. Whether you like 50's Doo-Wop, Classic Rock, 70's Funk, or Hip Hop; we have all of your favorites. We also cater to your guest's diversity with Italian, Irish, Asian, Indian, Latin, or Polish classics. Whatever your background, we have something to please everyone. We will provide you with a request form to tell us about your favorite music. We'll also honor your "do not play list". 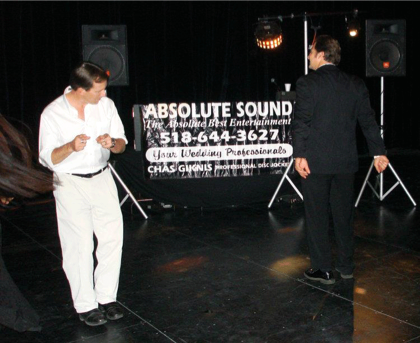 We can say with confidence that not all DJ services bring as wide a selection to your event as we do. If by some chance we don't have a song that you ask for, we'll make every effort to acquire it before your event.